Macbook Pro hard drive fails? Don't worry. With Recoverit Data Recovery, it can be a straightforward process to recover data from Mac hard drive. Can files be recovered from a failed hard drive? My hard drive on Macbook Pro failed suddenly when I was writing some business data. Anxious about losing the important data. Can you help me recover files from damaged hard drive on Mac? Thanks so much! There is no doubt that iMac is one of the best desktop computers we have today. Apple did well to create this personal computer. One thing to note, though, is that iMac’s hard drive is not immune to failure. It is susceptible to failure just like Windows hard disk drives. A dead iMac hard drive is beyond repair, although you can recover data from the failed hard drive. It cannot respond to read and write requests anymore. But why would Mac’s hard drive totally fail? The following are some of the reasons. Before you go to fix the dead Mac hard drive, you should get a reliable Mac hard drive failure recovery program to help you retrieve your data from dead hard drive. But you can check if you can browse your Mac hard drive data, the fact that your Mac hard drive is not responding does not mean that your data is lost too. Unless overwritten, data stored in a dead drive can be retrieved. As aforementioned, a hard drive death is not the end of everything. If you want, you can recover it safely via Mac hard drive recovery software - Recoverit Mac Data Recovery. This incredibly clever and thorough Mac hard drive recovery tool is the one you require to retrieve data from an unresponsive hard disk drive on Mac. Recoverit Data Recovery is no doubt the best and easiest way to get lost files back from Mac hard drive. It can take a bit longer time for those files that have been lost months or years ago, but the results will be authentic and satisfactory. It doesn’t damage your system. In fact, it is the wonderful too to perform mac hard drive data recovery for mac. Recover lost or deleted files, photos, audio, music, emails from Mac hard drive effectively, safely and completely. Supports data recovery from trash/recycle bin, hard drive, memory card, flash drive, digital/Drone camera, camcorders, etc. Supports to recover data due to sudden deletion, formatting, hard drive corruption, virus attack, system crash and more. Now, free download this Mac drive recovery software and take the below steps to recover files from damaged hard drive on Mac. If you're a Windows computer user and meet the same issue, please turn to the Windows version - Recoverit Data Recovery, and refer to this guide for dead hard drive recovery on Windows. First, you should make a selection of the lost files recovery path and scan decision. Select the dead hard disk on Mac where your data got lost. 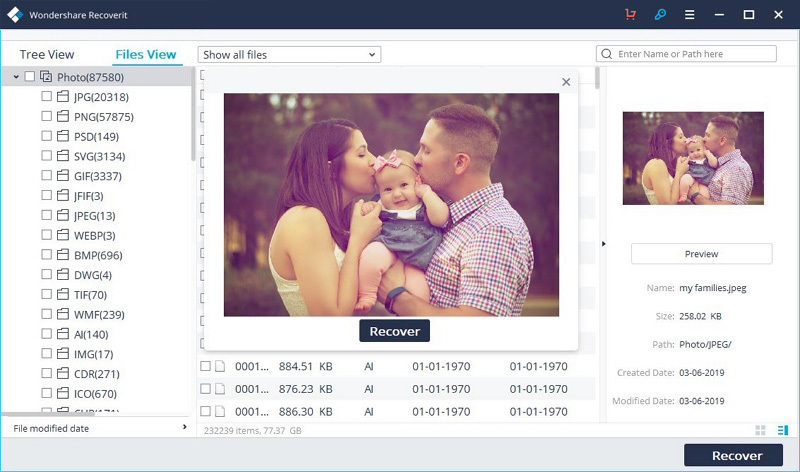 Recoverit will start an all-around scan on your dead hard drive on Mac. It is always helpful for the recovery of those lost files that have been deleted long time ago. It will take a long time to finish the scan, because your device or a system will perform extensive scanning. When the scan initiates, it will start searching for files or documents, and it will bring results. Just preview the results, select the file you want to recover and click "Recover" to get them back. Mac computer includes a builit-in disk repair tool, called Disk Utility, which is an easy and effective method of repairing dead Mac hard drive. Here are the stpes on how to repair Mac hard drive using the Mac disk repair tool. Restart your Mac computer firstly. Press and hold Command + R keys. Click "Disk Utility" and then "Continue". Go to "View" > "Show All Devices". Choose the Mac hard drive to be repaired. Click "First Aid" and then "Run". On finishing the above operations, Disk Utility will scan your Mac hard drive and report different error messages to you. For example, "overlapped extent allocation". This error means that files corrupted and you should find them out to replace, rewrite or delete. If this disk repair tool can't make your dead Mac hard drive fixed, you might need to back up all important data stored it or oftentimes, recover data from the damaged hard disk on Mac. Of course, it is recommended to use Recoverit Data Recovery since it can help you a lot on Mac hard drive recovery. Step 1On hearing the startup chime, reboot the Mac and hold down"Command + R" keys simultaneously to boot OS X into Recovery Mode.